Bacteria are really, really tiny, but this kit will help your students see common bacteria and fungus and discover just where it is lurking near you. It includes everything you will need to set up your own bacteria farm (you supply the bacteria - don't worry, it's everywhere.) Discover if hand sanitizers really do kill 99.9% of germs, find out if a dog's mouth is really cleaner than a human's, discover where the most bacteria is in your home or school. 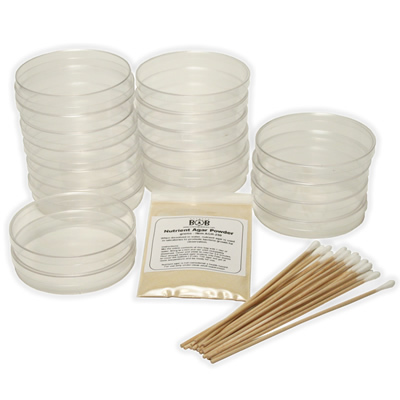 This simple kit will give clear and dramatic evidence of bacteria growth - sure to bring out the "Ewwww"s in any group of students (or adults). Where will we find bacteria? 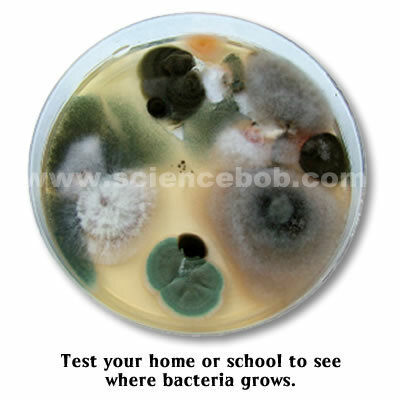 Bacteria are almost everywhere, and we provide suggestions in our guide for testing many areas for bacteria. It is also a great way to demonstrate the Scientific Method in action. How long does the Bacteria take to grow? Under the right conditions, results can be seen in less than a week. This experiment will show the world of common bacteria that is usually hidden from us by actually encouraging it to grow. Once the bacteria grows, the lid should stay on to keep the bacteria in one place. Petri dishes are sterile. For ages 7 and up with adult supervision. This was for science fir and they work great for my project. I use these in a HS Catering class to teach the kids about cross contamination and food safety. We swab doorknobs, phones, countertops before cleaning, etc. to emphasize the importance of handwashing and sanitizing surfaces. The growing cultures are an excellent visual for students about how "gross" everyday objects can be! This arrived quickly and everything was super easy for my daughter's science fair experiment! We lost our directions and they emailed us a new copy within an hour of us asking on a Sunday night! Talk about customer service! I would definitely order from here again! Easy to use, perfect for a science fair project! Cultures began growing within two days. His this was the best kit ever me and my son had a blast doing his science fair project. I think I had more fun then he did. I was impressed with the quick delivery. Preparing the Agar was not too bad. Swabbing the areas of consideration was done easily. Now we are just waiting to see what grows. I found out my son needed this kit as part of his science fair project. It was last minute and I was afraid it would not arrive in time but was pleased when it did (and it was around the Thanksgiving holiday). The directions were clear and my son had no problems using the kit. This is a great kit - relatively inexpensive, great directions, easy to use with even young (4th grade) students.